This is a split from the "Barding for horse legs" thread in Historical Arms. I think the tangent is worth pursuing. And the only "cavalry" remaining today evolved from heavy cavalry. I agree with placing role over equipment in the definition, as role has changed FAR less over history than equipment. However, the reason I call modern cavalry (excluding airmobile) a descendent of heavy cavalry is the armor. Though Bradley Fighting Vehicles and Strykers may be well-suited for light cavalry roles such as scouting, screening, and reconnaissance, the only reason they are tactically viable is that their armor keeps them alive. Until the demise of horse cavalry, light cavalry did not wear much if any armor to perform these roles. Now it's a prerequisite. In the urban combat that is especially prevalent today, these units (Armored Cav) perform a heavier role. They support the infantry by providing cover and extra firepower. They can have a shock value, too. In such a role they are more like knights than the light cavalry they were originally intended to be. A good example of modern light cavalry would be the use of Marine Recon units in the invasion of Iraq in 2003. They drove unarmored Humvees at the forefront of a huge mounted advance. In terms of their equipment (no armor and lighter weapons), they resembled light cavalry, but they walked a fine line between shock and screening/reconnaissance roles. Even present day modern armies stiil use the horse. US army had special light units go into Tora Bora on horseback. Mounted infantry realy. In several regions in Africa the horse is still a warriors tool and exclusively light cavalry: used for bandit raids just like it was 3000 years ago in asia and what revolutionised the north american plains indian way of life. It is more versatile than the universal pick-up truck since it does not need roads. Ah yes, that was 5th Special Forces Group. Excellent case of adapting to the situation at hand. Anything else is a compromise dictated by tactics, by mounted forces fullfilling tactical roles that strengthen the effectiveness and versatility of an army beyond ' mere' skirmishing centaurs. The extra contribution to the army however is NOT an improvement in 'cavalryness' as all that compromises the agility and speed of the horse compromises the centaur. Optimum therefor must be split in optimum for the army and optimum for the horsepowered human brain. Optimum for the latter means that less is more. Why is the optimum for the horseman always a minimum of armor? Doesn't survivability play a role in his combat effectiveness? I would argue that a compromise is inevitable, and for many roles the compromise must be made to sacrifice some agility for survivability. The same is true for infantry too. Some people call it evolution of language as an excuse for mistaken use and lack of inventiveness. Not to nitpick, but language does evolve. There are probably hundreds of examples in common usage where the root of the word no longer has a direct connection to the modern practice or meaning. I'm a sucker for horses too, but we've got to accept the fact that they're not of much use anymore on the battlefield (previous examples excepted). Great debate guys, let's continue the discussion! I had no prejudices on horse riding whatsowever, only a package of knowledge about ecology and ethology of animals that I filled in for horses. This LED to a perception of horse riding that differs a bit from the general perception. I like the original papers of Fedrico Caprilli a lot: his riding was about crossing heavy terrain with the least stress on man and horse. He come to the conclusion that the ultimate a rider could theoretically achieve is not to hinder the horse. In practical terms this translates to: as much as needed, as little as possible in just about every aspect of horse riding. Survival does not depend on what you take with you. That is another pitfall of modern society. The more you take complicates life too. You do not need a gps not even a compass to cross heavy going. In fact a gps can be mighty complicating as it is the TERRAIN that determains the actual route. Take horse shoes. Although there are several reasons why horses may need to be shod but it complicates life ENORMOUSLY for the horseman crossing rough terrain. Again the optimum is not shoeing and there must be serious reasons to do so to warrant the 'costs'. Concerning the pickup truck I was not a all implying they need roads. It does not take much of a rocky step of water gully to stop one. I have competed in enduro racing, raids, on offroad motorcycles and even those are no match for a horse in rough terrain. Adding say 20 pounds of equipment enarges the gap even further. Please read my contributions NOT as black OR white. Real life situations present 'bottle necks' that compromise the optimum but can still not be avoided. What I have experienced concerning horse riding is that many bottle-neck solutions have become generalised necessities. Nobody asks WHY thus WETHER these are necessary. Yes this does allow for even the barding of legs IF needed but will more likely lead to the mameluk solution of not engaging and waitng for cicumstances more suiteable for he advantages a horse gives. On cavalry there is a HUGELY interesting thread on the www.militaryhorse.org on the Rhodesian Greys Scouts. Sun Tsu is also very applicable. I should clarify what I meant by survivability; I was speaking in terms of combat survival (e.g. armor). I agree with your axiom of "as much as needed, as little as possible" for determining what equipment to take. It's easy to take too much in a vehicle, but if you or your horse has to bear the weight, then it's best to eliminate "comfort items" when possible. Technology can be a crutch as you mention; a map and a compass work fine for navigation almost all the time. I agree that a horse can get into places that vehicles cannot, but terrain that difficult also negates large-scale cavalry tactics. In that case the horse is just helping you travel, but I think one would prefer to dismount for a fight. Regarding the philosophy of burdening the horse as little as possible, what do you think of cavalry during the early era of firearms' dominance? Say 17th-19th century. I'd think that the cavalry in those periods most closely approached your ideal, as they had largely discarded armor to maximize their mobility in the face of musketry and artillery. This is a period when on the battle field ritual has just about disappeared and technichal developmenst have not yet taken over. Yes I think that cavalarists got to experience the properties of the horse again. A great examply of technical riding for me is Gaspard de Saunier who is very much aware of he mobility of the horse and the advantage that can be. Other examples that I like a LOT are the furusiya manuals and the tactics of Hanibal Barco who was VERY good at emplyoing his cavalries to effect. There is no critisism from my part about other forms of mounted warfare as real life often dictates circumstances. That I, personally am often baffled by historic strategies and tactics does not mean they were wrong or mistaken. The crux is that the horse is a VERY versatile tool for man in war that can be used effectively in many ways without making max. use of the specific properties. To see good examples of what the hose can do you can search YouTube for Pablo Hemosa de Mendosa (rejoneo) and Cirit. Pablo is a component of the unarmoured 17th century style dealing with a bull in enclosed circumstances. Cirit gives a living example of the tactics Xenophon and what I have done experiments about. Interesting, I had not heard of cirit before now. Looks like you need horses with some serious stamina for that! I've seen a few videos of Pablo on YouTube before. That's definitely some of the most amazing riding I have seen, and his horse is incredibly well-trained and quick-thinking. Have you ever seen a game of buzkashi? That is probably the most exciting equestrian game I have seen in person, but very rough too. For those who haven't heard of it, it's like polo with a dead goat or calf instead of a ball. I'll have to look into Saunier and Barco as I'm not familiar with their writing. I think that the lack of clarity in defining what comes from what in something like this is an excellent example of why evolutionary metaphors can be misleading and should be kept to a minimum. If one wants an outstanding example of the use of cavalry in the 19th century, one of the best generals to study is Nathan Bedford Forrest. A total novice at the beginning of the American Civil War, he ended up as perhaps the best general on either side and his tactics at Brice's Crossroads (a battle fought in Northern Mississippi) were studied by none other than Rommel and his staff during a visit to the US in 1937. Forrest's tactics are also required study at West Point and other prominent military Academies around the world. He operated using his cavalry in the traditional sense, but also as mounted infantry at other times. His "rule of thumb" so to speak, was get there first with the most men and dictate the battle. He was able to operate as part of a larger army or on his own as a separate command. He was not a big fan of the sword, rather supplying his troops with a brace of 6 shot Colt's Navy revolvers, which they were required to learn to reload while at a full gallop and with rifles and bayonets. This last proved especially useful in the role of mounted infantry. He was a daring raider, responsible for millions of tons of destroyed supplies and many miles of railroad track, while raiding behind Union lines in Alabama, Georgia, Mississippi and Tennessee, and was a constant source of irritation for Sherman prior to his march to the sea. He was able to raise three regiments of cavarly during the Civil War, the first using his own money and the other two from captured union supplies. Yes I am familiar with buzkashi, a bit less with Bedford Forrest. Neither tactics are of my personal interest as the technical riding is not very special. Buzkashi is a lot of physacal puliing on the bit and kicking with the heels. Bedford Forrest is post napoleontic forward riding. Yes William, language is VERY important as the confusing changes of meaning undermine understanding. Horse riding is particularly plagued by this as the role of the horse changed a few times of direction during history wheres terminology did not. At present modern riders are often discussing things without realising that the same terminology in classical (FEI-Olympic) dressage and renaissance style riding as the styles are separated by napoleontic warfare whereas words were continued. It gets even worse when riders have been tought by teachers with part knowledge and it is very common that riders have a FAULTY understanding of 'stellung'/'stelling' (curving/bending the horse). If the teacher is not aware of the correct meaning or does not know the pupils have been tought this incorrecty ther is no way technical quality can improve as there is no base to build upon. I always start my teaching by explaning what meanings I use and thus how the terms should be interpreted for understanding. This is crucial. Horse riders typically are not interested in this, they 'just' want to ride not study, so I do not teach a lot which leaves me with a few dedicated students and quality time. Win-Win. 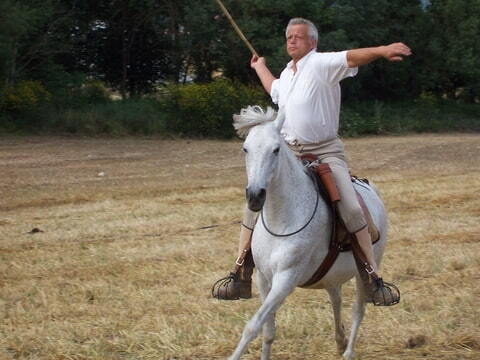 I once asked what is the proper body mechanics for swinging a sword from horseback. I asked this aware that if you just swing out you can place a tremendous amount of stress on you elbow and shoulder. I was told to observe poloplayers. The person advised me to swing down and the sword handle stops at the hip. The moment of impact has your hand in a position as if you were drawing a gun from a holster or trying to do pushups with you palms way back near your hips. The dynamics of this definitely take the stress off the ligaments and place it on the muscles. Does anyone here have any other thoughts on this? 1. to use the hands the rider mainly sits and steers with weight and legs. 2. action = -reaction, so every force you excert will need to be compensated or you will fall. There is a huge difference between RIDING the horse while using a weapon or using the horse as a platform. For the former he rider needs lower body controll pretty much independant from the weapon actions. It is therefor very effective to use a weapon like a mace and wield this in a manner retaining as much kynetic energy as possible. The light lance almost used as an overlong sword as described by the mamluks is close to ideal from a technical riding point of view. Reading Dom Duate it is clear that although he is thoroughly aware of the above, he leans a bit to the use as a platform. This is partly why he advises the riding through at speed method concering a melee. The horse, no doubt trained to do this, will then be less susceptible to leg/rider movement. I know this is profoundly off topic but I have had such a great time thinking up captions for the picture of you on horseback with the spear that I had to thank you. So far my favorite is, "Peter greets his mother in law"
Xenophon, On horsemanship, 431 B.C.-354 B.C. Well, the mobility of a single horseman, perhaps. But formation tactics often negated this mobility--the need to remain in formation itself already compromised mobility a great deal by requiring every horse in the squadron to move at the pace of the slowest horse, and of course the formation can be better maintained at the slower paces than at the faster ones. Remember all the fuss about making sure that the cavalry (or at least the heavy cavalry) charged at the trot? Even the theorists and cavalry commanders who wanted the horsemen to impact the enemy at a flat-out gallop agreed that they should only accelerate to this speed when the target formation was already very close. Even the theorists and cavalry commanders who wanted the horsemen to impact the enemy at a flat-out gallop agreed that they should only accelerate to this speed when the target formation was already very close. Which is telling about the level of riding skill and training of the horses, nothing else. When the combinations are skilled ONLY a flat out gallop will lead to differentiation over distance as not all combinations have the same top speed. This problem will have been not all that great either as the unit would have a relatively uniform type of horse. I LOVE the strategy and tactics of the numidian light cavalry. Those would all know their role, all be an element of the whole: the attack would be synchronous but not at all in ' formation' as we now define it. They would also disperse in all directions but not haphazzardly so as not to hinder or be hindered. I have found no mention of the two horse tactic outside of their home territory. As far as I can find they stayed true to the javelin(s) plus sometimes short sword and never used armour of any sort from 500 b.c. right untill the western roman empire fell apart in 4th century a.d. I wonder how that compared to earlier heavy cavalry - how often did they trot in formation until near impact? I suppose it varied greatly with the times and the army. It's an interesting question. Maintaining close formation for as long as possible would boost morale among the more jittery cavalry troopers, and perhaps present a more formidable appearance to the enemy. However, it would increase the amount of time you'd be exposed to effective fire. As for the cuirassiers, if their armour was proof against pistol they would have a slight advantage in a melee. Other than that it seems to have been mainly a psychological tool. Much like wearing your IBA in a Humvee - if you get hit by a big enough IED you're done anyway, but you'd feel somewhat naked without it all the same. Peter, I have to thank you for introducing me (and the forum) to so many diverse cavalry traditions. I often focus too narrowly on European examples, with the occasional foray of study into the mounted Samurai. Not exactly like the Numidian, but I've heard speculations that early horse archers in the Near East (Assyrian ones, I believe) operated in groups of two, with one rider holding the reins for both horses while the other shoots. Needless to say, this interpretation is rather controversial and many historians have questioned its feasibility, especially in the last few years. Yes. There was a great deal of variation. Trotting up until very close to the enemy seems to have been particularly common for cavalry meant to operate in deep formations, though, especially the deep pistol-armed battering rams of the 16th and 17th centuries. Totally correct. Military writers in the 19th century debated the utility of the cuirass, with some saying that it's not really worth much while others maintain that it was still useful against the enemy's swords and bayonets--but interestingly, both camps largely agreed that the cuirass made the wearer braver in the attack, especially against infantry. with one rider holding the reins for both horses while the other shoots. Needless to say, this interpretation is rather controversial and many historians have questioned its feasibility, especially in the last few years. There is beautiful chinese artwork depicting horse archers over a huge span of time. The loose reins and a long ' safety rope' ticket under the belt is a constant. The biomechanics of archery are not compatible wih horse riding: one can either have a body posture adapted to communicate with the horse OR adapt the posture for shooting: thise ae different. *moder day dressage oriented riding seems to deny the horse any intelligence and capability; even to walk by itself. Horses often are 'trained' to be helpless hereby confirming those misguided beleifs.